Studs are super popular right now, & lately I've been obsessed with them. I've always loved big earrings, but studs are so comfortable, easy, & chic, that I've been loving them more then my chandelier's. The fun thing about studs is that there are so many cute styles out there, which give you the opportunity to constantly change up your look. Above I put together a collage of some of my favorite looks. The Pave Stud Earrings are beyond chic & look gorgeous dressed up or down, they are so great that I've given them as gifts to a bunch of my friends. 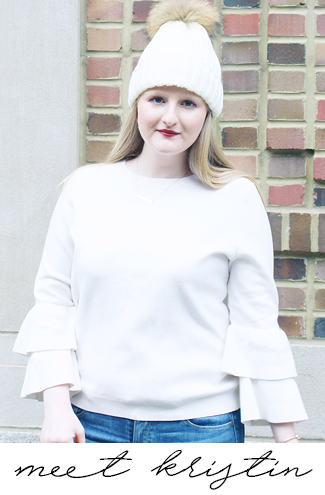 The monogram & pearl styles are very classy & preppy, every girl should own a pair of pearl earrings (real, fake or both, honestly the more the better). The gold pyramids are very on trend at the moment & edgy. A nautical style is perfect for summer time, but can be worn all year round, I have a friend that loves anchors so much she has like 10 different pairs. The small pink square earrings, the roses, & the bows are all super feminine & will add a girly touch to any outfit. Lastly, the little Kate Spade pretzels are beyond adorable & a little quirky, making them fun & unexpected! 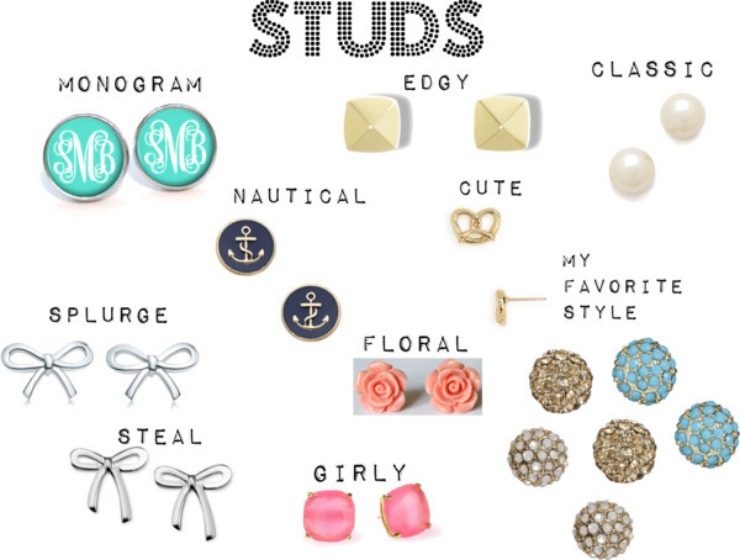 Each of these stud 'categories' are great ones to base your stud collection off of. They also make for great gifts (Christmas ideas! ), everyone loves getting jewelry & studs are universally flattering! So which of these earrings are your favorite? Those pretzel ones are adorable! I usually wear my small diamond studs daily. I really should get some fun pairs! I love studs so much more than big earrings, especially if I'm wearing a statement necklace. A simple pair of pearl ones go with everything. I've been into studs lately too! All of these are so pretty it's hard to pick a favourite... I think I'll go with the classic pearl earrings because those are the ones I wear the most. great post! I love the nautical earrings! I pretty much only ever wear studs. I LOVE those bows! I love them all, such great picks! i'm always on the hunt for a new pair of studs, especially because i lose so many of them! love the pearl ones. I wear my pearls every day (got most likely to be wearing pearls three semesters in a row as my sorority superlative) but my boss got me the nautical ones and I absolutely love them! Such a classic.